CTBO Now Up 50% from Alert Price! CTBO has been on a major rally since our alert last Thursday morning and is now up 49.76% from our alert price of $2.09! 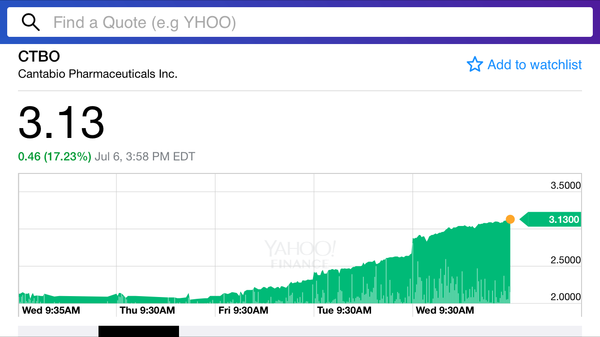 CTBO closed at highs again yesterday of $3.13 and has now closed at the high of day in each of the last three trading sessions. After yet another strong close at highs yesterday, CTBO could continue this major rally to new highs again today. Below is the 5 day chart on Cantabio(CTBO). Congrats again on this tremendous winner! Stay tuned and thank you for your patience as we search for our next alert. Reminder: If you decide to trade, remember to always use limit orders to control the price you are willing to pay. For Quicker Alerts Text Keyword "STOCKS" to 24587 to Receive our SMS Mobile Alerts! We are engaged in the business of marketing and advertising companies for monetary compensation. All content in our releases is for informational purposes only and should not be construed as an offer or solicitation of an offer to buy or sell securities. Neither the information presented nor any statement or expression of opinion, or any other matter herein, directly or indirectly constitutes a solicitation of the purchase or sale of any securities. SmallCapLeader.com sponsored advertisements do not purport to provide an analysis of any company's financial position, operations or prospects and this is not to be construed as a recommendation by SmallCapLeader.com or an offer or solicitation to buy or sell any security. Neither the owner of SmallCapLeader.com nor any of its members, officers, directors, contractors or employees is licensed broker-dealers, account representatives, market makers, investment bankers, investment advisors, analyst or underwriters. Investing in securities, including the securities of those companies profiled or discussed on this website is for individuals tolerant of high risks. Viewers should always consult with a licensed securities professional before purchasing or selling any securities of companies profiled or discussed in our releases. It is possible that a viewer's entire investment may be lost or impaired due to the speculative nature of the companies profiled. Remember, never invest in any security of a company profiled or discussed in a release or on our website unless you can afford to lose your entire investment. Also, investing in micro-cap securities is highly speculative and carries an extremely high degree of risk. To review our complete disclaimer and additional information, please visit SmallCapLeader.com. SmallCapLeader.com makes no recommendation that the securities of the companies profiled or discussed in our releases or on our website should be purchased, sold or held by investors. Third parties and/or affiliates of SmallCapLeader.com may at any time have a position in the securities mentioned herein and may increase or decrease such positions without notice which will negatively affect the market. Smallcapleader.com has been compensated seventeen thousand five hundred dollars by a third party(Think Ink Marketing) for an investor awareness campaign regarding CTBO, which has expired. Any compensation received constitutes a conflict of interest as to our ability to remain objective in our communication regarding the profiled company. Notice of Stock Price Movements and Volatility. Viewers of this newsletter should understand that trading activity and stock prices in many if not all cases tend to increase during the advertisement campaigns of the profiled companies and in many if not all cases tend to decrease thereafter. This tends to create above average volatility and price movements in the profiled company during the advertisement campaign that viewers should take into consideration at all times. Campaigns vary in length, and many are for short periods of time, typically less than a week. Some of the content in this release contains forward-looking information within the meaning of Section 27 A of the Securities Act of 1 993 and Section 21 E of the Securities Exchange Act of 1 934 including statements regarding expected continual growth of the profiled company and the value of its securities. In accordance with the safe harbor provisions of the Private Securities Litigation Reform Act of 1 995 it is hereby noted that statements contained herein that look forward in time which include everything other than historical information, involve risk and uncertainties that may affect a company's actual results of operation. A company's actual performance could greatly differ from those described in any forward looking statements or announcements mentioned in this release. Factors that should be considered that could cause actual results to differ include: the size and growth of the market for the company's products; the company's ability to fund its capital requirements in the near term and in the long term; pricing pressures; unforeseen and/or unexpected circumstances in happenings; etc. and the risk factors and other factors set forth in the company's filings with the Securities and Exchange Commission. However, a company's past performance does not guarantee future results. Generally, the information regarding a company profiled is provided from public sources which we believe to be reliable but is not guaranteed by us as being accurate. Further specific financial information, filings and disclosures as well as general investor information about the profiled company, advice to investors and other investor resources are available at the Securities and Exchange Commission ("SEC") website www.sec.gov and the Financial Industry Regulatory Authority ("FINRA") website at www.finra.org. Any investment should be made only after consulting with a qualified investment advisor and reviewing the publicly available financial statement and other information about the company profiled and verifying that the investment is appropriate and suitable. SmallCapLeader.com makes no representations, warranties or guarantees as to the accuracy or completeness of the information provided or discussed. Viewers should not rely solely on the information obtained in this release or on our website. Viewers should use the information provided by us regarding the profiled companies as a starting point for additional independent research on the companies profiled or discussed in order to allow the viewer to form his or her own opinion regarding investing in the securities of such companies. Factual statements, or the similar, made by the profiled companies are made as of the date stated and are subject to change without notice and SmallCapLeader.com Network has no obligation to update any of the information provided. SmallCapLeader.com its owners, officers, directors, contractors and employees are not responsible for errors and omissions. From time to time certain content in our releases or website is written and published by our employees or third parties. In addition to information about our profiled companies, from time to time, our releases and website will contain the symbols of companies and/or news feeds about companies that are not being profiled by us but are merely illustrative of certain activity in the micro cap stock market that we are highlighting. Viewers are advised that all analysis reports and news feeds are issued solely for informational purposes. Any opinions expressed are subject to change without notice. It is also possible that one or more of the companies discussed or profiled in our release or on our website may not have approved certain or any statements within the website. 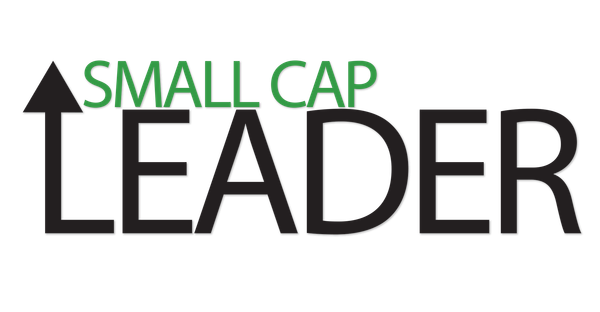 SmallCapLeader.com encourages viewers to supplement the information obtained from this release and our website with independent research and other professional advice. The content in this release is based on sources which we believe to be reliable but is not guaranteed by us as being accurate and does not purport to be a complete statement or summary of the available data. This release may provide hyperlinks to third party websites or access to third party content. SmallCapLeader.com, its owners, officers, directors, contractors and employees are not responsible for errors and omissions nor does SmallCapLeader.com control, endorse, or guarantee any content found in such sites. By accessing, viewing, or using the website or communications originating from this release, you agree that SmallCapLeader.com, its owners, officers, directors, contractors and employees, are not responsible for any content, associated links, resources, or services associated with a third party website. You further agree that SmallCapLeader.com, its owners, officers, directors, contractors and employees shall not be liable for any loss or damage of any sort associated with your use of third party content. Links and access to these sites are provided for your convenience only. SmallCapLeader.com uses third parties to disseminate information to subscribers. Although we take precautions to prevent others from obtaining our subscriber list, there is a risk that our subscriber list, through no wrong doing on our part, could end up in the hands of an unauthorized party and that subscribers will receive communications from unauthorized third parties. You agree to hold SmallCapLeader.com, its operators, owners and employees harmless and to completely release them from any and all liability due to any and all loss (monetary or otherwise), damage (monetary or otherwise), or injury (monetary or otherwise) that you may incur arising out of the use of our website or the information in our press releases, profiles and opinions. You agree that use of our website is at your sole risk. SmallCapLeader.com disclaims all warranties of any kind, express or implied. We encourage viewers to invest carefully and read the investor issuer information available at the web sites of the SEC. The SEC has launched an investor-focused website to help you invest wisely and avoid fraud at www.investor.gov and filings made by public companies can be viewed at www.sec.gov and/or then FINRA at: www.finra.org . In addition, FINRA has published information at its website on how to invest carefully at www.finra.org/investors/index.htm. Questions regarding any information contained in this report may be sent to info@SmallCapLeader.com. To review Small Cap Leader’s website and its disclaimer, please visit www.SmallCapLeader.com.